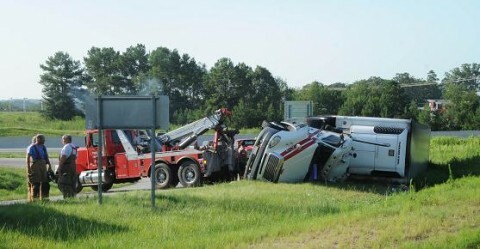 Traffic on the exit ramp of I-85 onto Hwy.178 was blocked for several hours Tuesday after a tractor trailer rig took the exit to fast and turned onto it’s side. The contents of the trailer, which were heading to Taco Bell, never spilled out and was off loaded. The driver was pinned inside the cab for about an hour and was freed with minor injuries. SC Hwy. Patrol, Hopewell Fire Dept., Sandy Springs Fire Dept. and Med Shore responded to the accident which happened at approximately 7:30 a.m.